To help kick off our one year anniversary weekend, we now have Amsden tees for sale online + in-store! I wanted to design our first Amsden tee to be super simple and look like a classic vintage advertisement. These are so soft and unisex sizing, available in S-XXL for $25 each. You can shop them online using the checkout below or in-store as well! What's NEW: Online Ordering for Amsden Coffee Bags! You can now order your favorite Amsden coffee in 12 oz. bags online! Right now we have our house Amsden Dark and Amsden Light grinds available as well as a seasonal Pumpkin Pie Spice. All our coffee is roasted locally by Lexington Coffee + Tea. Shop 12 oz. bags and our favorite coffee mugs and accessories below! Some of my newest obsessions are these chai flavored candles from The Growing Candle ! The container is a reusable planter and the label is embedded with wildflower seeds that you can plant once your candle is gone 🌱! They come in all different styles and sizes and we have chai and apple cinnamon scent to choose from ($26-35). Seriously THE perfect housewarming or hostess gift to have on hand for gifting! Hurry and grab your favorite because we only have 1-2 of each pot/scent combination available and they're going fast! Shop our newest arrivals at Gathered Mercantile for your home + kitchen! These are perfect for entertaining, gifting, or decorating your shelves and all are $40 + under. Available both online and in-store. Shop our newest jewelry just in time for fall! We've added lots of simple minimal pieces for layering as well as some fun boho statement pieces too! Shop all the latest below or in-store too! 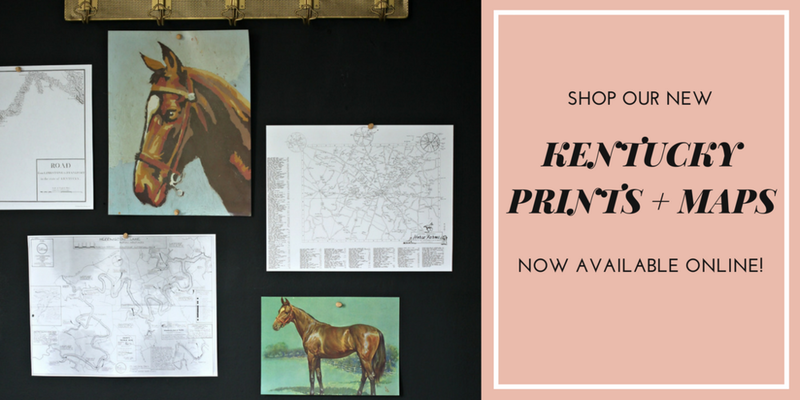 I'm excited to release this new collection of vintage-inspired Kentucky + horse prints! All the prints shown below are available, most in a variety of sizes and some even have framing options to choose from! The vintage horse farm map and Herrington Lake map are two of my favorites! All the map prints are also available in an oversized poster option- you can frame them in as one or split them into a mini gallery like below! Shop the full collection below and don't forget to use code KENTUCKY for 10% OFF! How gorgeous are these watercolor prints from Honey Brush Design?! Her tea towels are one of our best sellers and now she offers prints as well! These are printed on gorgeous handmade paper and perfect for framing or gifting- $20 for an 8 x 10 and we have several styles available. Shop them all below! Use code "BLOOM" at checkout for 20% off all weekly, bi-weekly, or monthly flower subscription orders through June 30, 2018.